I was excited to get to this part of the process, not only to get rid of the vinegary rotten-gas smell in the garage, but it was a quick way to see a big difference. I also knew that there would be a bunch of varnish and rust in the fuel tank that would have to come out, or we'd never get this baby running. The Eastwood Company is an online shop for auto restoration that specializes in coatings that resemble OEM finishes. 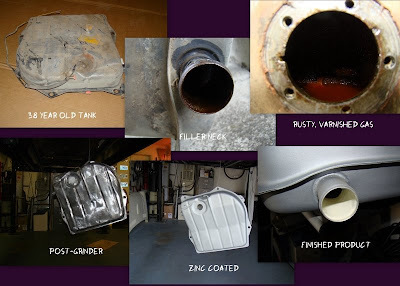 They carry a gas tank sealing kit that allows you to revitalize your old tank in twelve easy steps! It was a pretty filthy and environmentally questionable process, but it turned out pretty well in the end. The final photo shows the pristine coating in the filler neck that is supposed to be uniform throughout the gas tank's interior. Unfortunately, it was no where near that coated for most of the tank, but it should pretty much keep all the crap out of the rest of the fuel system, so I figure I got my money's worth. 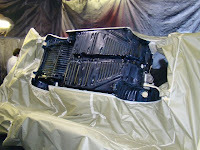 One major hurtle was that the 18", or so, of fuel line that act as an intake within the tank itself, was completely varnished shut. After trying to figure out how to clean a piece of tubing that has an inside diameter of less than 1/4" and also has two 90 degree bends in it, I settled on using a frayed piece of bicycle brake cable in a drill motor to ream it out. This, mixed with a little Zippo fuel as a solvent, worked remarkably well. Last thing was to spend a little quality time with my old friend the angle-grinder to clean off the outside of the tank, and shoot it with a special zinc coating for gas tanks from Eastwood's. Well, it finally happened. After over a year of prepping, pondering and a little painting, Matilda actually made it into Line-X for undercoating. 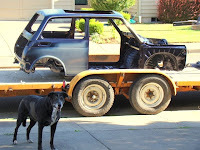 My original plan was to load the body on the cheesy folding Harbor Freight utility trailer that I bought especially for this purpose, stuff the rotisserie into the back of my truck, and attempt to set up this contraption by myself. Thankfully Chad decided not only to help, but to rope his dad, Jim, into the adventure as well. Turns out, that three guys can just pick the body up, and put it wherever it needs to go. The fact that Jim also has a fourteen foot car hauler that allowed us to put the whole setup on a moving platform, didn't hurt either. 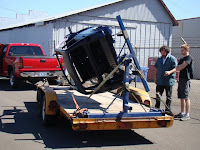 I had envisioned the need for all sorts of elaborate cribbing to hold the car in place during the trip to Salem, but since we were able to simply lift it into place when attaching it to the rotisserie, we just let it ride on the trailer deck, which it did like a champ. I noticed a number of people on I-5 trying to get a closer look at the strange little car on that trailer . 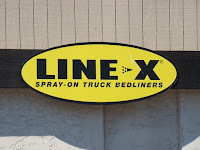 When we arrived at Line-X, we were greeted by the owner, Wade Starbuck and his crew. They were great to work with, as they were both professional and helpful. 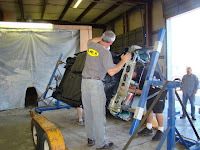 I was asked about use of the vehicle, placement of the material, and to what thickness I wanted it applied. Wade even went so far as to call me after the masking was complete to see if I wanted to get some pictures of the process! He explained that the material is a two part chemical blend that is kept separate as it is heated and pressurized to 2500 psi, before it is mixed by the spray gun during application. The amazing thing to me, is that after ten seconds it is set up well enough that you can walk on it! Another surprise is that Line-X is also practically non-toxic. I thought that any material that had all of these properties would definitely be adding to the hole in the ozone layer, but I guess we'll have to look to our other pursuits for that. Needless to say, I couldn't be happier with the finished product. This is exactly what I've had in mind for the last year. 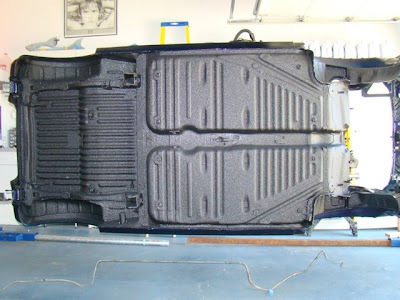 We have a surface that is practically bullet-proof, let alone rust-proof and will cut down on road noise. The best part is, now we have a great base on which to build a beautiful little car.